The Le Sigh: Premiere: Emily Reo - "Charlie"
Premiere: Emily Reo - "Charlie"
Listen to Emily Reo's contribution to The Le Sigh Vol. III. The first time I listened to Emily Reo was in my dorm room in Ithaca, New York. That was over four years ago when "Peach" and "Metal" appeared on Crash Symbols' bewitching Clubhouse split. My life was wildly different then than it is now, but even today, listening to her latest release Spell 10" in my Brooklyn apartment brings me to a clearheaded, tranquil place. "Spell" feels like a hypnotic meditation; the lyrics are stark, sad, but the feeling is haunting and relate-able. 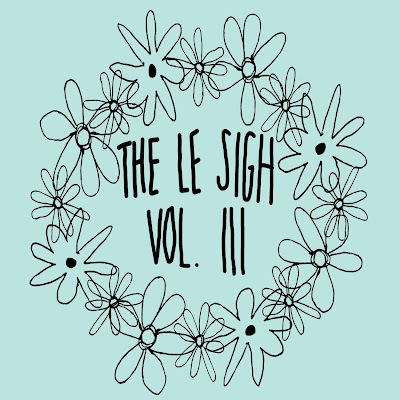 Reo's newest song "Charlie," which we're excited to share today as a preview to The Le Sigh Vol. III is no different. "Charlie" - a demo off her upcoming album - is tale of grief and loss that unfolds into a powerful ode to her cat Charlie. Read more about the new track below. "Charlie is my kitten who died last summer. He was diagnosed suddenly with a rare terminal illness called FIP, and I wrote this song during his last week alive with him sitting on a chair next to me. I tried to express the universal feeling of loss, whether it be a friend, family member or pet, but I also tried to emphasize the ways in which our loved ones never leave us. After Charlie died, my partner Jack and I came up with a code to feel connected to him. If it was cloudy we decided he was feeling cozy and taking a nap, If it was clear or sunny we'd say he was awake and happy. Thunder = hungry, rain = drooling (of course). I started calling him my baby blue because that's the sky when I imagine he is feeling his best. Jack and I co-produced this song, I did the mixing and it was mastered by Andrew Sardinha. My friend and bandmate Felix pointed out that the only thing I would write a love song about is a cat, so here I present to you - my "first love song"!" Listen to Emily Reo on bandcamp. Album artwork by Sarah Kennedy. Pre-order the cassette from Father/Daughter Records.